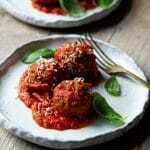 Juicy Italian meatballs made with delicious herbs and spices and cooked in a simple, rich tomato sauce. These Italian polpette are served as they are with some fresh crusty bread to mop up the best bits! Easy, delicious and full of flavour! Ever have a craving for juicy Italian meatballs but they turn out dry, tasteless and a damn disappointment? Uggh, how annoying is that? Well….I have an amazing recipe that will make all your meatball dreams come true (is it just me that dreams about meatballs?). They are soft, extra juicy and packed…I mean packed with delicious flavour. There are a few tricks and tips to making the very best Italian meatballs (called Polpette in Italian in case you were wondering). First, choose the best quality beef you can get ahold of. I use Aberdeen Angus premium quality ground beef because I live in Scotland and it’s the best quality. Use fresh breadcrumbs rather than hard store bought crumbs. Fresh crumbs are fluffier and soak up more juice and flavour. Add dried seasonings such as fennel seeds (my fave), oregano, marjoram, salt and pepper. Brown the meatballs first to create a crust on the outside then simmer slowly in the best tomato sauce. Why go to the effort of making the best meatballs and then plonk them in a so-so average sauce, right? 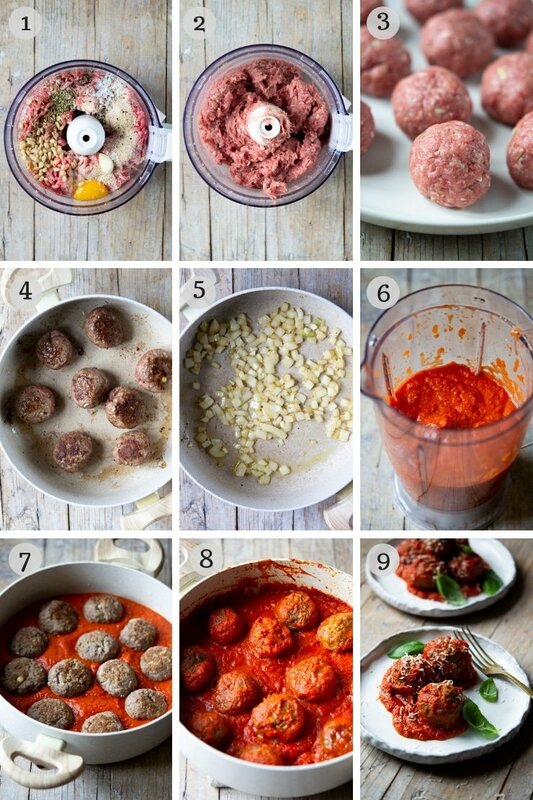 All the meatball ingredients are placed in a food processor and blitzed until thoroughly combined and smooth. Next using your hands, shape the mixture into meatballs by rolling them one by one in the palms of your hands (photos 1-3). 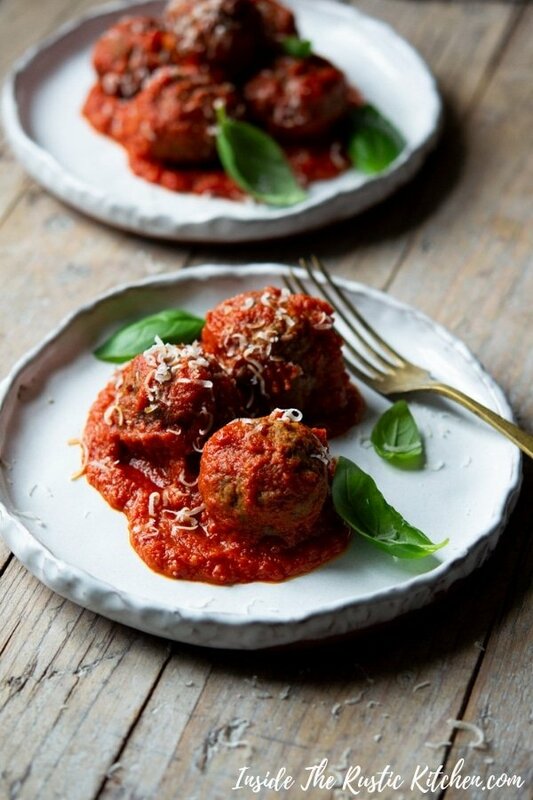 Top Tip: When rolling the meatballs they should be shiny and smooth with minimal to no cracks on the surface. Heat a little olive oil in a pan and brown the meatballs on all sides, set aside on a plate. Next, saute the chopped onion in the same pan until soft (photos 4 & 5). Place the cooked onion in a blender with good quality canned chopped tomatoes and blitz until smooth. Add the sauce to the pan with salt, pepper, tomato paste and a small pinch of sugar. Simmer the sauce on a low heat for 10 minutes. Add the meatballs back to the sauce and gently toss them so they are covered in the sauce, simmer slowly for 30 minutes (photos 7-9). Salt and Pepper – Seasoning your meatballs is just as important than any other ingredient! Traditionally in Italy meatballs are served as a main course without pasta. They are usually served with creamy polenta (which is to die for, recipe coming soon) or with crusty bread. P.S If you do love meatballs then you NEED my recipe for mozzarella stuffed meatballs in your life, they are insane and so easy to make. 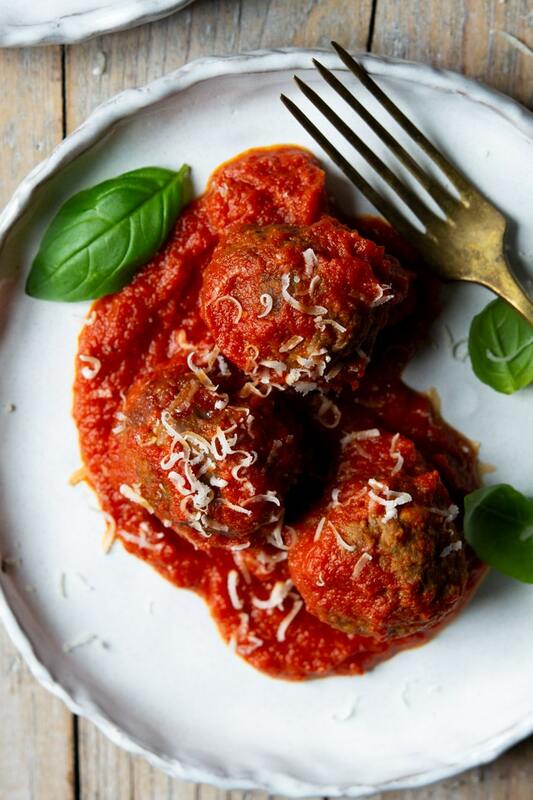 If you’ve tried these Italian Meatballs or any other recipe on the blog please let me know how you got on in the comments below, I love hearing from you! You can also FOLLOW ME on FACEBOOK, TWITTER, INSTAGRAM and PINTEREST to see more delicious food and what I’m getting up to. All the meatball ingredients are placed in a food processor and blitz until thoroughly combined and smooth. Next using your hands, shape the mixture into meatballs by rolling them one by one in the palms of your hands. This should make 12-13 meatballs. Heat a little olive oil in a pan and brown the meatballs on all sides, set aside on a plate. Next, saute the chopped onion in the same pan until soft. Place the cooked onion in a blender with good quality canned chopped tomatoes and blitz until smooth. Add the sauce to the pan with salt, pepper, tomato paste and a small pinch of sugar. Rinse out the tomato cans with a little water and add that to the sauce (fill each can about 1/4 full) Simmer the sauce on a low heat for 10 minutes. Add the meatballs back to the sauce and gently toss them so they are covered in the sauce, simmer slowly for 30 minutes. Serve with a sprinkling of freshly grated parmesan or pecorino cheese and torn basil leaves. First, choose the best quality beef you can get ahold of. I use Aberdeen Angus premium quality ground beef because I live in Scotland and it's the best quality I can get. Use fresh breadcrumbs rather than hard store bought fine hard crumbs. Fresh crumbs are fluffier and soak up more juice and flavour. Add dried seasonings such as fennel seeds (my fave), oregano, marjoram, salt and pepper. Don't skip the fennel seeds if you can they add a ton of flavour. Brown the meatballs first to create a crust on the outside then simmer slowly in the best tomato sauce. The crust creates a seal on the outside that helps keep all the flavour and juices inside. Uggh, I had ONE job! Haha thanks so much for pointing that out Diana I’ve just added it in now! Hi Emily! Your Italian meatballs look so tasty! I love the step-by-step photos and how you’ve organized them…super helpful!! I just ate and now you’re making me hungry again, lol! Hi Alia, thanks so much! Hahah that’s pretty much the story of my life! Mmm! What could be more delicious than a plate of tasty meatballs..food to make you go ooooh yesss!! Pahahah…I’ll just leave you here with the meatballs.